Having been a Pet Groomer for going on 18 years now, I am often asked grooming questions. Rogue was asking about trimming his dogs toenails....and there IS an easy way to do black nails that many dont know about. Since there are so many pet owners on the board, I just thought I would share. 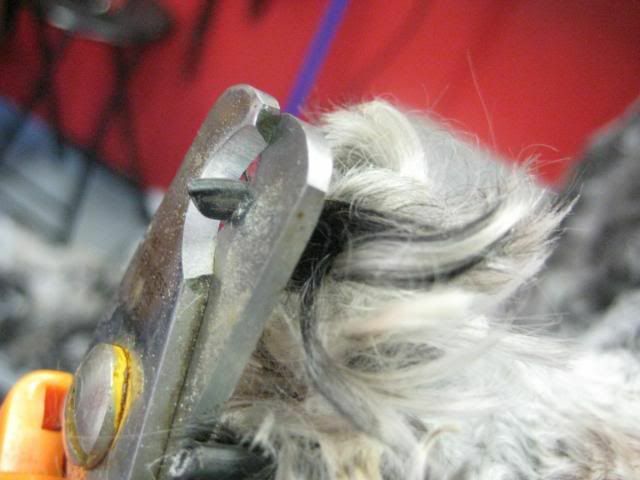 The same rules apply whether you are using nail trimmers, a dremel/Pedi Paws etc. White/light colored nails are easy. The pink that you see through the nail is the living quick or nerve. As long as you cut in front of that, you'll be fine. If you cut into the pink, you will make the nail bleed. On black nails its a bit diferent. 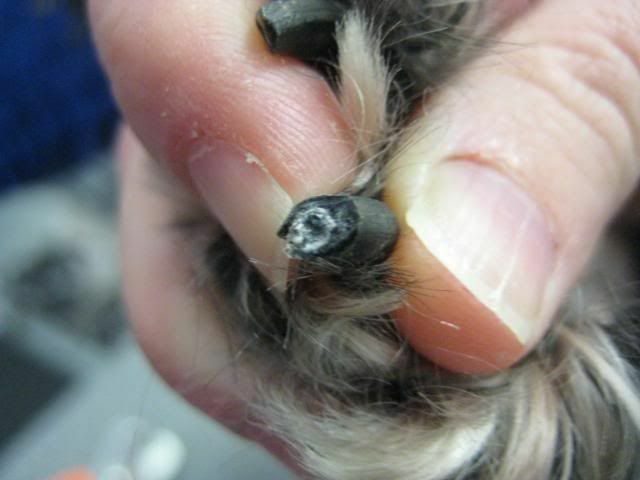 Here is an untrimmed black toenail, about 8 weeks growth. With your nail trimmers, shave off just the tip of the nail, we are talking 1-2 mm at a time. After the first little snip, look at the end of the nail straight on. Notice that the center is WHITE. As you get closer to the nerve, the center will start to turn darker. Notice the bit of gray? Another snip, an its even darker. The center of the nail is now very BLACK. This is where you want to stop. If you cut beyond this, you will make the nail bleed. Here is what the nail now looks like. As a side note, cutting to far and making the nail bleed is not really a big deal.....well, besides the dog running around bleeding all over your floor. Like most minor things, they just bleed a lot. I use styptic powder to stop the bleeding. 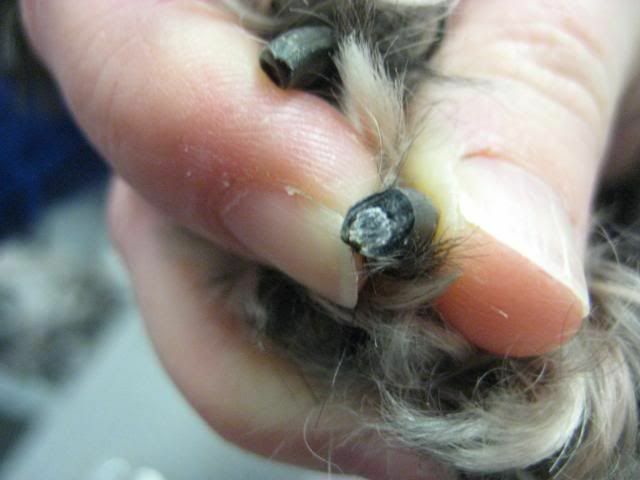 If you dont have any, a pinch of flour from your kitchen, packed into the end of the nail will help stop any bleeding. 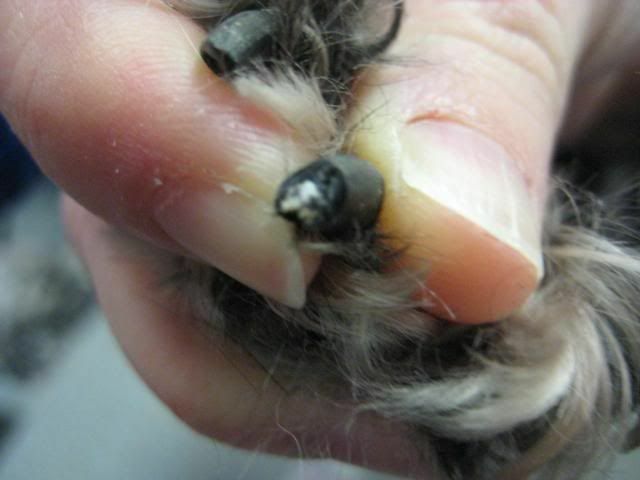 As for behavioral issues while trimming nails......if your dog yelps, jerks its foot away etc. and you stop, you are just rewarding for that behavior. I NEVER let go when I am trimming nails. If the dog wants to throw a fit, so be it, I calmly continue what I am doing. After one or two times of this, the dog learns that its just something that it has to accept. No, they will never like it, but just like with your kids getting shots at the doc.......it just has to be done for their health. LOL - I was going to ask about the first step: put your dog in a headlock and hold on. 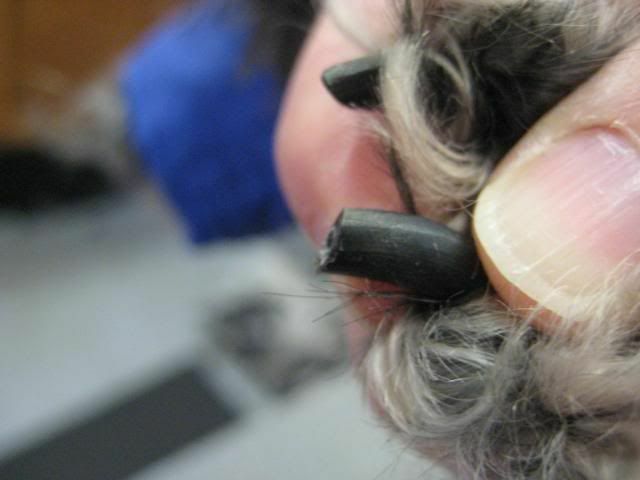 Trimming a LARGE dogs nails too short can result in issues other than the nail bleeding. A friend of mine attempted to save a few bucks by trimming his Labs nails himself. LOL Harley............well......what you didnt see in my photos was that this particular little dog requires a muzzle for nail trimming, and a nice little sedative hidden in a treat before her daddy brings her in. The downside to trimming "just the tips" like so many people do, is it actually encourages that nerve in the center of the nail to grow even longer. 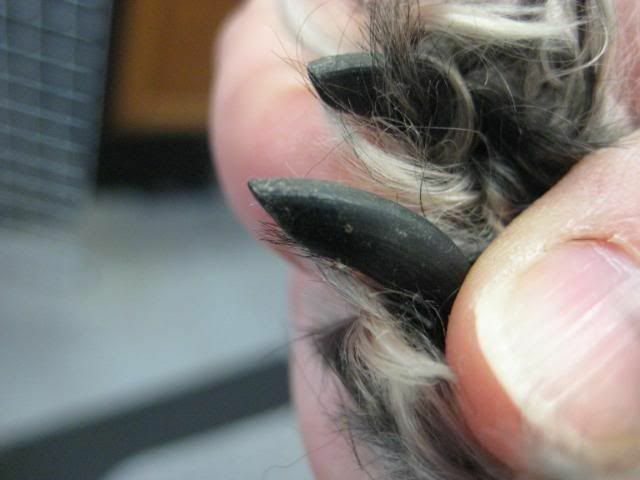 Thats why so many dogs have long nails even after they've been trimmed. No worries, I can keep Butch's nails trimmed properly. Shannon, thanks for the tutorial. Can you tell me what kind of sedative can be given? I have a horrible time with my two lab mixes. Lacey would rather break her leg or anything else trying to get away rather than have her nails clipped. I try sneaking up on her while she is sleeping, doesn't work. Honestly Lori......sedatives dont do much. They make them groggy, confused and they often fight even worse because of it.....like the little dog in the photo. They feed her a sedative before every groom but she still tries to bite and has to be muzzled. Just for her nails mind you, otherwise she is great. Try trimming just one single nail.....praise the heck out of the dog and give really good treats not offered for any other reason. Next day, do another nail. MAYBE eventually the dog will learn to tolerate the process. For ones that are truly impossible.....and yes some WILL actually injure themselves in an effort to avoid a nail trim, those are best treated at the vet. Sedated heavily by the vet and the nails trimmed back short. I used to be vet assistant and we did have to do this occasionally. The only other option is to have your dog on a rough surface on a frequent basis. Dogs that are often walked on cement will usually have shorter nails. My two dogs for instance..........our entire property is basalt and the side of the property where they are has lots of basalt hills/boulders/gravel etc. I almost never have to trim their nails because of it. Shannon, thanks for all the extra info and I'll try the one nail at a time. Haha, been there, done that. Good tutorial! Now go out and spend $20 on that pedi-file thing. OOPS, I mean the pedi-whats it, pedi-paws?? And some sedatives, for you. And some treats for both you and your pet. Now, how do you do it to a cat? Surprise: to cause to feel wonder or astonishment by being unexpected. Happens every time I crack (now cut!) a rock. I found that the pedi paws didn't work. I returned it to the store. The nail would get caught up inside it and make the dogs yelp. Yep, that was kinda my point (laughing at myself for buying the darn thing!). The tut was great, you can see what's good and what's not. I do clip my cats' razor sharp claws, but not on the same day I treat them for earmites. "Don't cry because you are leaving, smile because you were there." 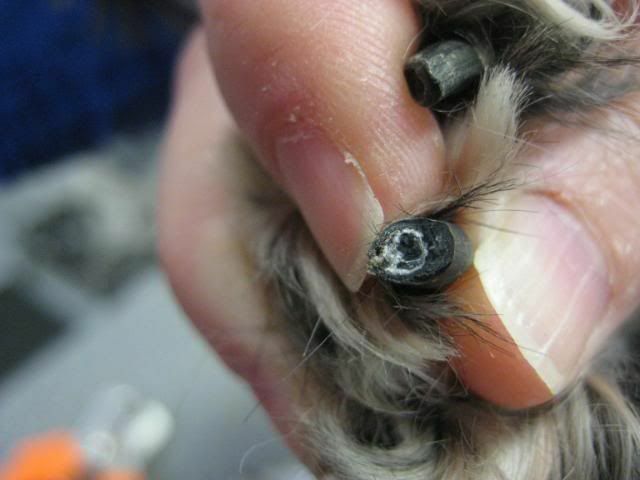 And can we chew these dogs nails? Just like we do our own?? "My friends have made the story of my life. In a thousand ways they have turned my limitations into beautiful privileges and enabled me to walk serene and happy in the shadow cast by my desperation." The nails do get caught up once in a while, but I have to use a quick, controlled rounding motion to avoid that. Not easy while working on a moving target, I assure you . One thing I also want to mention is that those batteries discharge fast on their own! Used it once on a full charge, went to use it again after 3 weeks and found dead batteries. Must charge it before using to insure I can use it. This happened the other day and I just clipped instead of going through all that. One thing I also want to mention is that those batteries discharge fast on their own! Used it once on a full charge, went to use it again after 3 weeks and found dead batteries. Must charge it before using to insure I can use it. ROTFL, Rogue. The Pedi-Cure has a rechargeable battery. I keep fresh batteries around for the other battery-operated tools, Silly. I want to be reincarnated as a dog. 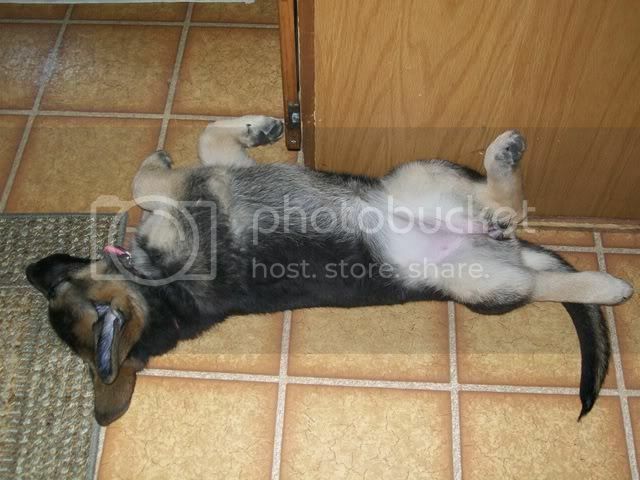 We had to put our German Shepard down last May. She was almost 15 years old. But before she entered her golden years I'd just play frisbee with her on the driveway and down the sidewalk. The cement did a good job grinding down her nails. Once she got old though it was such a hassle trimming those black nails. I wish I would have had this tutorial then. We eventually just started paying the vet to cut her nails. I was just asking my vet about this the other day!! Thank you so much for the very useful/helpful information!! Two of my dogs have black nails and I'm TERRIFIED to trim their nails! I ask the vet and the groomer and all they say is "it's best that you just let us do it" ... Well yeah, duh! It's best for your wallet, not mine!! Lol!!! Thanks again!! !